The Jungle Books: Tiger! Tiger! Where is the power that made your ride? Brother, I go to my lair--to die! Now we must go back to the first tale [“Mowgli’s Brothers”]. When Mowgli left the wolf’s cave after the fight with the Pack at the Council Rock, he went down to the ploughed lands where the villagers lived, but he would not stop there because it was too near to the jungle, and he knew that he had made at least one bad enemy at the Council. So he hurried on, keeping to the rough road that ran down the valley, and followed it at a steady jog-trot for nearly twenty miles, till he came to a country that he did not know. The valley opened out into a great plain dotted over with rocks and cut up by ravines. At one end stood a little village, and at the other the thick jungle came down in a sweep to the grazing-grounds, and stopped there as though it had been cut off with a hoe. 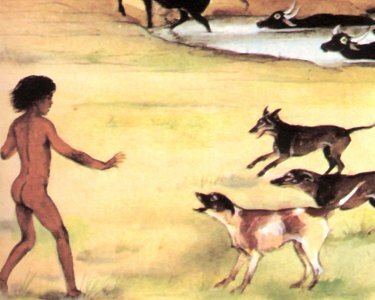 All over the plain, cattle and buffaloes were grazing, and when the little boys in charge of the herds saw Mowgli they shouted and ran away, and the yellow pariah dogs that hang about every Indian village barked. Mowgli walked on, for he was feeling hungry, and when he came to the village gate he saw the big thorn-bush that was drawn up before the gate at twilight, pushed to one side. “They have no manners, these Men Folk,” said Mowgli to himself. “Only the grey ape would behave as they do.” So he threw back his long hair and frowned at the crowd. The crowd parted as the woman beckoned Mowgli to her hut, where there was a red lacquered bedstead, a great earthen grain chest with funny raised patterns on it, half a dozen copper cooking-pots, an image of a Hindu god in a little alcove, and on the wall a real looking-glass, such as they sell at the country fairs. So Mowgli stretched himself in some long, clean grass at the edge of the field, but before he had closed his eyes a soft grey nose poked him under the chin. “Thou wilt not forget that thou art a wolf? Men will not make thee forget?” said Grey Brother anxiously. For three months after that night Mowgli hardly ever left the village gate, he was so busy learning the ways and customs of men. First he had to wear a cloth round him, which annoyed him horribly; and then he had to learn about money, which he did not in the least understand, and about ploughing, of which he did not see the use. Then the little children in the village made him very angry. Luckily, the Law of the Jungle had taught him to keep his temper, for in the jungle life and food depend on keeping your temper; but when they made fun of him because he would not play games or fly kites, or because he mispronounced some word, only the knowledge that it was unsportsmanlike to kill little naked cubs kept him from picking them up and breaking them in two. He certainly had no notion of what fear was, for when the village priest told him that the god in the temple would be angry with him if he ate the priest’s mangoes, he picked up the image, brought it over to the priest’s house, and asked the priest to make the god angry and he would be happy to fight him. It was a horrible scandal, but the priest hushed it up, and Messua’s husband paid much good silver to comfort the god. And Mowgli had not the faintest idea of the difference that caste makes between man and man. When the potter’s donkey slipped in the clay pit, Mowgli hauled it out by the tail, and helped to stack the pots for their journey to the market at Khanhiwara. That was very shocking, too, for the potter is a low-caste man, and his donkey is worse. 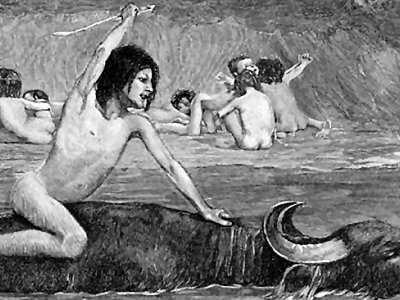 When the priest scolded him, Mowgli threatened to put him on the donkey too, and the priest told Messua’s husband that Mowgli had better be set to work as soon as possible; and the village head-man told Mowgli that he would have to go out with the buffaloes next day, and herd them while they grazed. No one was more pleased than Mowgli; and that night, because he had been appointed a servant of the village, as it were, he went off to a circle that met every evening on a masonry platform under a great fig-tree. It was the village club, and the head-man and the watchman and the barber, who knew all the gossip of the village, and old Buldeo, the village hunter, who had a Tower musket, met and smoked. The monkeys sat and talked in the upper branches, and there was a hole under the platform where a cobra lived, and he had his little platter of milk every night because he was sacred; and the old men sat around the tree and talked, and pulled at the big hookahs [water-pipes] till far into the night. They told wonderful tales of gods and men and ghosts; and Buldeo told even more wonderful ones of the ways of beasts in the jungle, till the eyes of the children sitting outside the circle bulged out of their heads. Most of the tales were about animals, for the jungle was always at their door. The deer and the wild pig grubbed up their crops, and now and again the tiger carried off a man at twilight, within sight of the village gates. “True, true, that must be the truth,” said the greybeards, nodding together. The custom of most Indian villages is for a few boys to take the cattle and buffaloes out to graze in the early morning, and bring them back at night. The very cattle that would trample a white man to death allow themselves to be banged and bullied and shouted at by children that hardly come up to their noses. So long as the boys keep with the herds they are safe, for not even the tiger will charge a mob of cattle. But if they straggle to pick flowers or hunt lizards, they are sometimes carried off. Mowgli went through the village street in the dawn, sitting on the back of Rama, the great herd-bull. 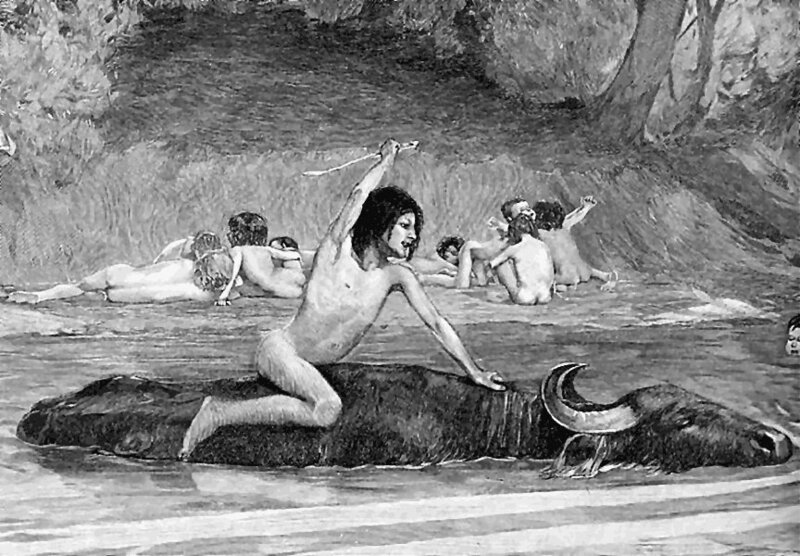 The slaty-blue buffaloes, with their long, backward-sweeping horns and savage eyes, rose out their byres, one by one, and followed him, and Mowgli made it very clear to the children with him that he was the master. He beat the buffaloes with a long, polished bamboo, and told Kamya, one of the boys, to graze the cattle by themselves, while he went on with the buffaloes, and to be very careful not to stray away from the herd. Then Mowgli picked out a shady place, and lay down and slept while the buffaloes grazed round him. Herding in India is one of the laziest things in the world. The cattle move and crunch, and lie down, and move on again, and they do not even low. They only grunt, and the buffaloes very seldom say anything, but get down into the muddy pools one after another, and work their way into the mud till only their noses and staring china-blue eyes show above the surface, and then they lie like logs. The sun makes the rocks dance in the heat, and the herd children hear one kite (never any more) whistling almost out of sight overhead, and they know that if they died, or a cow died, that kite would sweep down, and the next kite miles away would see him drop and follow, and the next, and the next, and almost before they were dead there would be a score of hungry kites come out of nowhere. Then they sleep and wake and sleep again, and weave little baskets of dried grass and put grasshoppers in them; or catch two praying mantises and make them fight; or string a necklace of red and black jungle nuts; or watch a lizard basking on a rock, or a snake hunting a frog near the wallows. Then they sing long, long songs with odd native quavers at the end of them, and the day seems longer than most people’s whole lives, and perhaps they make a mud castle with mud figures of men and horses and buffaloes, and put reeds into the men’s hands, and pretend that they are kings and the figures are their armies, or that they are gods to be worshipped. Then evening comes and the children call, and the buffaloes lumber up out of the sticky mud with noises like gunshots going off one after the other, and they all string across the grey plain back to the twinkling village lights. Day after day Mowgli would lead the buffaloes out to their wallows, and day after day he would see Grey Brother’s back a mile and a half away across the plain (so he knew that Shere Khan had not come back), and day after day he would lie on the grass listening to the noises round him, and dreaming of old days in the jungle. If Shere Khan had made a false step with his lame paw up in the jungles by the Waingunga, Mowgli would have heard him in those long, still mornings. At last a day came when he did not see Grey Brother at the signal place, and he laughed and headed the buffaloes for the ravine by the dhâk-tree, which was all covered with golden-red flowers. There sat Grey Brother, every bristle on his back lifted. “He swam far down the Waingunga to cut that off,” said Grey Brother. “Not I, perhaps--but I have brought a wise helper.” Grey Brother trotted off and dropped into a hole. Then there lifted up a huge grey head that Mowgli knew well, and the hot air was filled with the most desolate cry of all the jungle--the hunting howl of a wolf at midday. “How far?” said Grey Brother, panting and snapping. “Till the sides are higher than Shere Khan can jump,” shouted Mowgli. “Keep them there till we come down.” The bulls swept off as Akela bayed, and Grey Brother stopped in front of the cows. They charged down on him, and he ran just before them to the foot of the ravine, as Akela drove the bulls far to the left. “Well done! Another charge and they are fairly started. Careful, now--careful, Akela. A snap too much and the bulls will charge. Huyah! This is wilder work than driving black-buck. Didst thou think these creatures could move so swiftly?” Mowgli called. “Ha! Ha!” said Mowgli, on his back. “Now thou knowest!” and the torrent of black horns, foaming muzzles, and staring eyes whirled down the ravine just as boulders go down in floodtime; the weaker buffaloes being shouldered out to the sides of the ravine where they tore through the creepers. They knew what the business was before them--the terrible charge of the buffalo herd against which no tiger can hope to stand. Shere Khan heard the thunder of their hoofs, picked himself up, and lumbered down the ravine, looking from side to side for some way of escape, but the walls of the ravine were straight and he had to hold on, heavy with his dinner and his drink, willing to do anything rather than fight. The herd splashed through the pool he had just left, bellowing till the narrow cut rang. 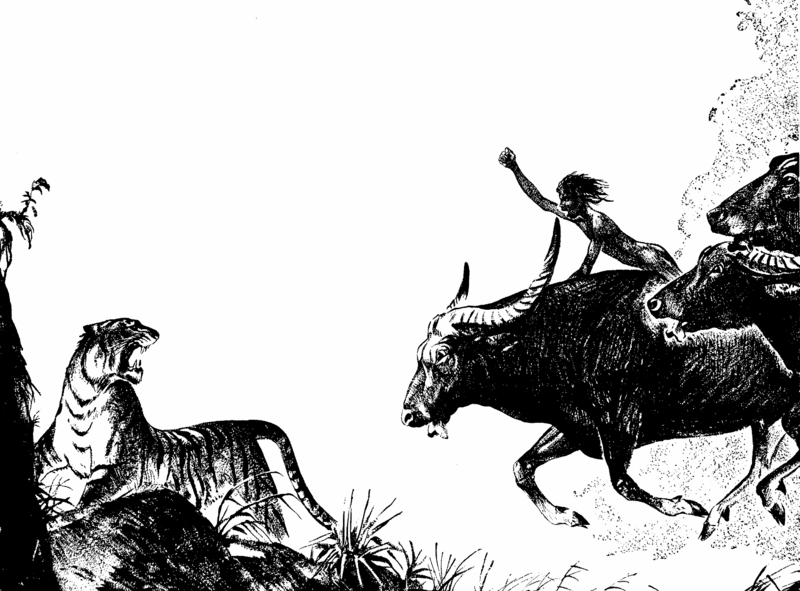 Mowgli heard an answering bellow from the foot of the ravine, saw Shere Khan turn (the tiger knew if the worst came to the worst it was better to meet the bulls than the cows with their calves), and then Rama tripped, stumbled, and went on again over something soft, and, with the bulls at his heels, crashed full into the other herd, while the weaker buffaloes were lifted clean off their feet by the shock of the meeting. That charge carried both herds out into the plain, goring and stamping and snorting. 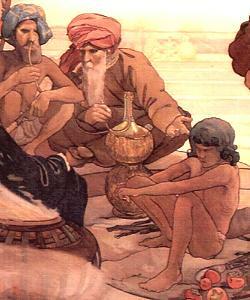 Mowgli watched his time, and slipped off Rama’s neck, laying about him right and left with his stick. 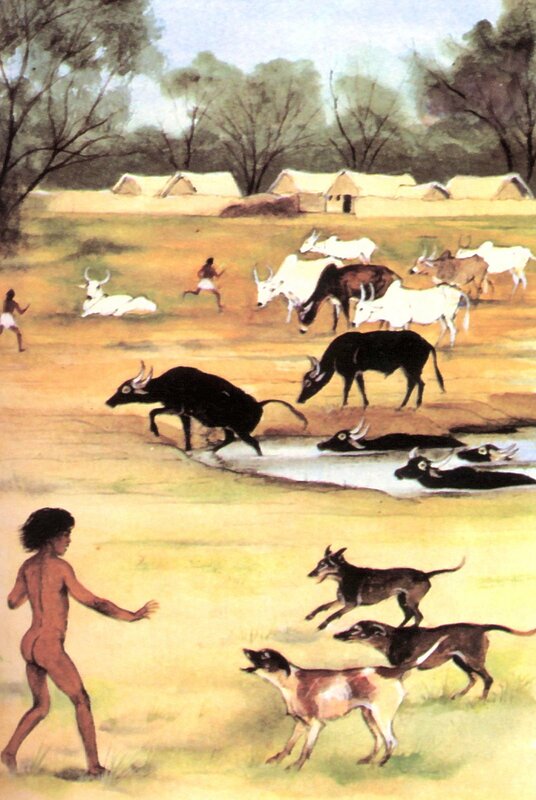 Akela and Grey Brother ran to and fro nipping the buffaloes’ legs, and though the herd wheeled once to charge up the ravine again, Mowgli managed to turn Rama, and the others followed him to the wallows. “What is this folly?” said Buldeo angrily. “To think that thou canst skin a tiger! Where did the buffaloes kill him? It is the Lame Tiger too, and there is a hundred rupees on his head. 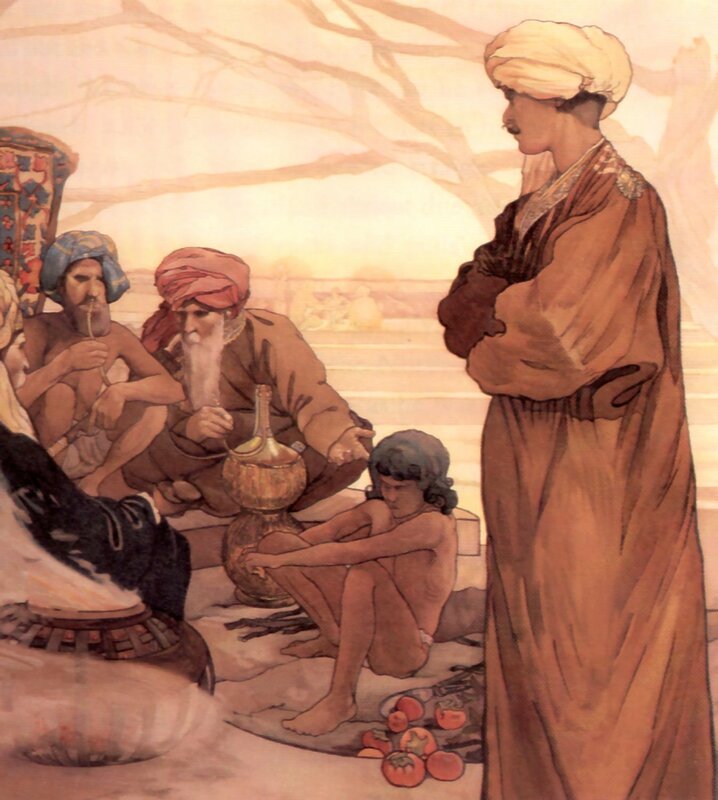 Well, well, we will overlook thy letting the herd run off, and perhaps I will give thee one of the rupees of the reward when I have taken the skin to Khanhiwara.” He fumbled in his waist cloth for flint and steel, and stooped down to singe Shere Khan’s whiskers. Most native hunters singe a tiger’s whiskers to prevent his ghost haunting them. Buldeo, who was still stooping over Shere Khan’s head, found himself sprawling on the grass, with a grey wolf standing over him, while Mowgli went on skinning as though he were alone in all India. “Yes, said Mowgli, without turning his head, chuckling a little. “Little Brother, it is well done,” said a deep voice in the thicket. 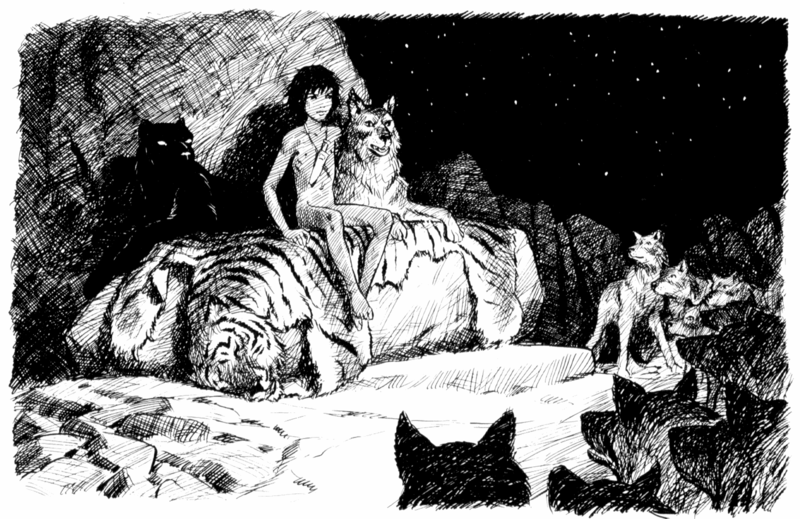 “We were lonely in the jungle without thee”, and Bagheera came running to Mowgli’s bare feet. They clambered up the Council Rock together, and Mowgli spread the skin out on the flat stone where Akela used to sit, and pegged it down with four slivers of bamboo, and Akela lay down upon it, and called the old call to the Council, “Look--look well, O Wolves,” exactly as he had called when Mowgli was first brought there. Ever since Akela had been deposed, the Pack had been without a leader, hunting and fighting at their own pleasure. But they answered the call from habit; and some of them were lame from the traps they had fallen into, and some limped from shot wounds, and some were mangy from eating bad food, and many were missing. But they came to the Council Rock, all that were left of them, and saw Shere Khan’s striped hide on the rock, and the huge claws dangling at the end of the empty dangling feet. It was then that Mowgli made up a song that came up into his throat all by itself, and he shouted it aloud, leaping up and down on the rattling skin, and beating time with his heels till he had no more breath left, while Grey Brother and Akela howled between the verses. So Mowgli went away and hunted with the four cubs in the jungle from that day on. But he was not always alone, because, years afterward, he became a man and married. [That story is told in “In the Rukh”--but the story of Mowgli, Buldeo and Messua is continued in “Letting In the Jungle”]. drink again? Sleep and dream of the kill. I am alone on the grazing-grounds. Grey Brother, come to me! with the angry eyes. Drive them to and fro as I order. lies the Lame One! Up, Shere Khan! Up and kill! Here is meat; break the necks of the bulls! ants have come up to know it. There is a great assembly in his honour. naked. I am ashamed to meet all these people. The Man Pack are angry. They throw stones and talk child’s talk. them no harm, but they were afraid of me. Why? the village gates are shut. Why? village and the jungle. Why?